We are located inside the Mad Giant Brewery at the 1 Fox Precinct in Ferreirasdorp. This is the oldest part of town and the heart of Johannesburg. The origins of our suburb started with Colonel Ignatius Ferreira an adventurer from the Cape Colony. He acquired a few claims in the vicinity which had high gold content. The first tent was erected in 1886 and gold was discovered in September of that year. In 1893 Hubert Davies and Co leased the land at 1 Fox St from Robinson Mining Company to set up their workshops and stores. It is said that Davies installed the first telephone on the goldfields. Hubert Davies and Co left 1 Fox in the early 1960’s. When we took occupation of the building, the remnants of a paint shop, a makeshift office and a safe were left behind. We stripped out the inside of the building to showcase the old steel structure and to celebrate the history of 1 Fox and Johannesburg. Mad Giant (the brewery) decided to use the space as it’s new home in 2015. The idea was always to have a destination brewery. This created the opportunity for a restaurant. Both the kitchen and the brewery is completely visible to visitors. We opened our doors on 9 June 2016. Jack Coetzee is our executive chef and the mastermind behind the menu. 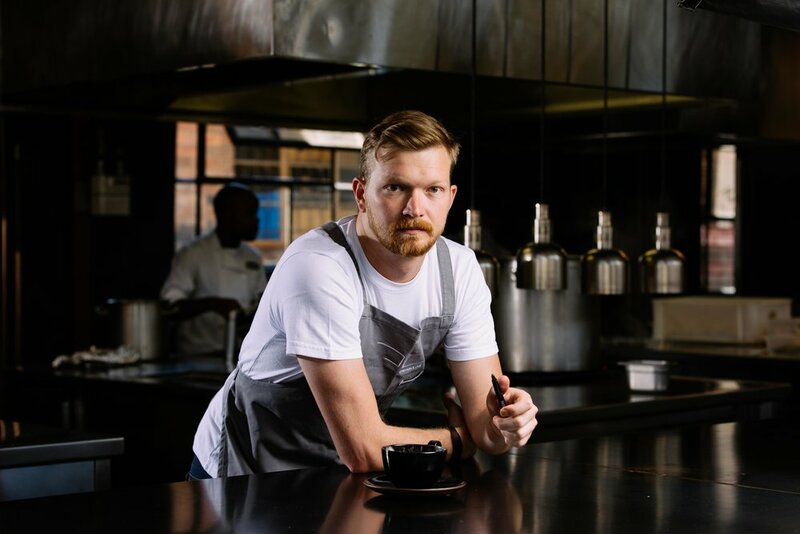 His mission is to put the focus on sustainable dining with the aim to inspire others and intrigue our customers, Jack was born and raised in Zimbabwe and moved to Cape Town for culinary school. He managed to rack up time in some impressive kitchens and under the tutelage of some notable names. Thereafter he got the offer to head up Urbanologi. We have been fortunate to win the best designed restaurant and bar in Africa & Middle East award at the 2017 International Restaurant and Bar Design Awards. Eat Out magazine awarded us best tapas restaurant in Gauteng. In 2018 we received our first plate from the JHP Gourmet Guide (only 25 plates are issued each year) and we consistently achieve 4.9 stars on Zomato. All of this is proof that we have an incredibly dedicated team that truly love creating a great dining experience. Jack’s cooking style is based on ethical culinary practices. These include sustainability, zero waste and wholesome cooking. Our ingredients are sourced from specially selected farms within 150 km from the restaurant, Combining these fresh and tastier ingredients with his skill ensures an experience packed with flavour and creativity. Mad Giant was co-founded in 2014 by Eben Uys who decided to apply his PhD to brewing. The brewery has won multiple awards with the most prestigious being the Grand Champion award for best beer at the IBD African beer awards 2018/19. With sustainability in mind, Mad Giant took the bold step of fighting single use plastic by changing to paper based labels and 4-packs. Visit www.madgiant.co.za for more info on their beers. The Sheds market is located inside the 1 Fox Precinct and currently undergoing a major revamp. The new launch is planned for June 2019.